Introducing the first jet-powered hydrofoil surfboard. Designed for maximum fun, safety, and durability. No matter your skill level, you will be flying across the water experiencing a feeling you’ve only dreamed of! Fly over water, carving turns like a snowboard in fresh powder, with the feeling of riding an endless wave even when there are no wind or waves. It’s smooth, fast, and will make your hair stand up on the back of your neck with excitement. Join Pre-Order Email List Now to Receive Special Bonus! JUST TRY IT. YOU’LL LOVE IT. If you’re a kiteboarder, surfer, ride SUP’s, snowboard, mountain bike or any other extreme sport you are going to absolutely be addicted to riding an electric hydrofoil! Imagine the feeling of riding a never-ending wave, snowboarding in waist deep powder, and flying all combined together for the best of all worlds. Almost anyone can learn to fly with our ultra stable board and foil design. Our wings flow smoothly below the surface of the water while you fly above. No matter what speed you prefer, slow and floaty, or fast and intense VeFoil has you covered! Safety is our number one concern which is why we designed this unique propulsion system that has no sharp edges, and the impeller is fully enclosed. If you have ever ridden a hydrofoil before then you know just how easy it is to kick the wings or mast by accident when treading water beside your board. The thought of swimming around or falling into a propeller is not a comforting thought. So we decided to create a propulsion system where the impeller is enclosed in a sleek round torpedo-shaped housing eliminating impeller exposure. Also, the water intake automatically closes when the propulsion system is on the beach or exposed to air and will not open no matter the throttle position eliminating the risk of someone touching the impeller. This revolutionary design is safer, more streamlined, and uses fewer parts, which means more fun, lower cost, and less maintenance. Foil Swells Without Power for Increased Experience and Ride Time! The jet was designed to be an extension of your body while surfing. Unlike a large propeller-driven board which acts as a large water brake when the throttle is released. Furthermore, the water intake automatically opens and closes with the throttle position which means when you let off on the throttle the jet intake closes and the propulsion system glides through the water effortlessly for foil surfing waves. Our streamlined torpedo jet system eliminates propeller induced drag thus allowing you to foil and fly across the water to provide a natural foil surfing experience while increasing ride time and enjoyment. Imagine a long downwinder foil session with our board to catch any swell/wave you want on demand! Modular VeFoil board design adds incredible valuable. In less than 5 minutes you can convert your electric hydrofoil into a kiteboard, wake foil, or sup foil board. Just unplug the battery and jet-powered mast from the electrical box, and remove. Then bolt on our classic foil mast to the board and wings, and you have a foil board with a large storage compartment for gear, food, water and more! Fly across the water carving turns to experience a never-ending surf feeling. Remove the electronics and use the board to kite foil, wake foil, or sup foiling! The VeFoil will get you flying no matter if you are a beginner or skilled foiler, and weigh between 70kg to 100kg. This shortened, extra thick and wider deck improves flotation and stability while standing, and allows for quicker planning to get you up on foil and safe recoveries when you lose balance. The shortened board is highly maneuverable and more comfortable to transport. Our goal was to design a product that anyone could learn, have fun on, and ride safely. This product ideal for anyone wanting to foil and fly making it ideal for watersport schools, boaters, and commercial rental shops. 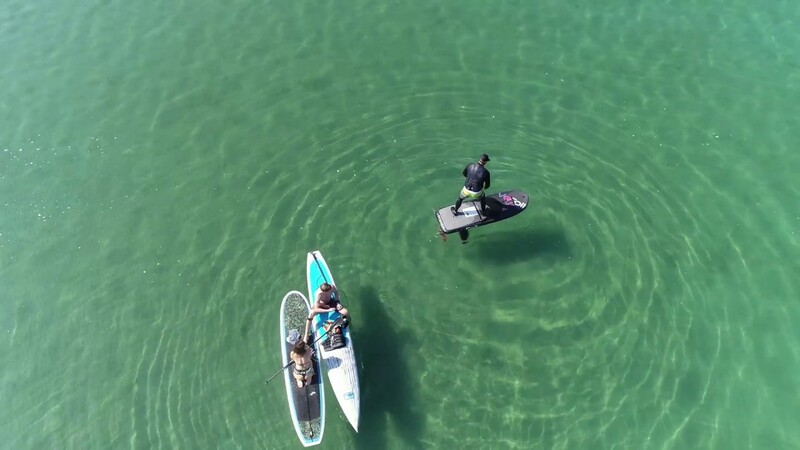 The VeFlow SUP foil eliminates the struggle of not being able to catch or keep up with the waves and opens the doors to riding even on the calmest of days. This unique big-wing design gives you the best of both worlds – ultra stable lift needed to get even the heaviest of a rider (250lbs) on foil and carving turns. What makes the VeFlow foil so remarkable is the speed range it provides. You can foil at 7mph or fly at speeds of up at 20 mph which is a massive rideable range you don’t find with other hydrofoils wings. If you want more speed and agility, then you add our smaller surf/sport front wing. Larger rear wing increases stability and locks-in turns, plus the added bonus of being able to pump the foil for more speed when riding without the motor. The fuselage has two mast connection points to match your ride style. A 71 cm (28 in) mast is the ideal length for tapping into the energy of the waves. PACKAGE INCLUDES 71 cm (28 in) mast, 84cm front wing, 48cm (20″) rear wing, custom travel bag, fuselage, brass, and titanium hardware. Our VeControl gives you complete control for an effortless, smooth ride. By squeezing the throttle, you fly at speeds of up to 20+ miles per hour. The motor automatically shuts off if the trigger is released, the hand controller is submerged in water, or the hand controller is greater than 10 feet from the board. When your board battery gets low on power the computer will automatically reduce throttle to 50% signaling you to head to shore. The controller was designed to feel amazing in your hand, work well, and keep you flying while keeping it affordable. Our Samsung Lithium-Ion IP68 waterproof batteries are swappable and provide 40-50 minute ride time depending on your weight/speed/skills. – Custom BMS (Battery management system) with over-charging, over-discharging, high current, and short circuit protection. – Custom fireproof battery bag for safely storing your battery. It all started when a couple of us dreamed about how cool it would be to have a remote controlled jet mounted onto the bottom of our hydrofoil surfboard so we could power out into the swells or fly around our bay when there was no wind or waves. We imagined the unique experience and fun it would provide by using the jet to get into ocean swells without the need for a towboat or SeaDoo. And how being able to foil the waves naturally without jet power would change the way we hydrofoil forever. Surfing and foiling are two experiences that only a surfer can genuinely understand. The silent and incredible feeling of harnessing wave power is nothing short of incredible. It was at that moment during are dream/brainstorming session a couple of us got so excited and said: “Let’s Make It!” and the dream project started a life of its own with a small Successful Kickstarter Project to get things started. Our first couple prototypes were clunky ducted propeller units using reduction gears. But, quickly realized a propeller drive would not allow for our wave only power hydro foiling experience. Through the process of elimination (reducing size, weight, and parts) we nailed down exactly how to build what we needed, so it was streamlined, affordable, had fewer moving parts, safer, and to improve wave riding without motor power. Now, nearly 18 months later we have something revolutionary. Thanks to the 366 fellow backers/supporters from around the globe who share the same passion about this incredible experience and product who donated money to help us create the product, we are proud to say we now have the product we have all been dreaming about! We are truly blessed to have such an incredible team and loyal supporters as it would have never happened without the crowdfunding, and crowd-design ideas from everyone. We are proud to say that we don’t have any research and development costs. Thus we can pass the savings on to you! Is an entrepreneur, quasi-mechanical engineer, pilot, technical analyst, and he has built several interesting things from taser/stun gun, motorbike w/sidecar, and floating sand dredge to name a few. His passions are kiteboarding, spear spearfishing and riding electric hydrofoils. Ian has been passionate about water sports since he was a young child. He was a member of the Canadian Sailing Team and coached windsurfing all around the world. He has lived in Maui, Florida, Europe, Carribean, and now resides in Canada. Our 3D print, CAD design, and prototype builder/tester. Simon is an entrepreneur and can’t help but take on new and exciting challenges. He works in cryptocurrencies, acts as a director for a MakersSpace, and studies video editing, and other computer skills. DaveBurt.ca has 30 years’ experience as an image specialist with a degree in technical illustration and works with photographers, CGI artists, and graphic designers. He is likely going fast, either on a snowboard, sailboard, mountain bike or in his car, on a race track. Miles is an experienced Industrial Designer and owns Studio 63. He loves water and winter sports. Miles is an award-winning design for various products and has worked for many years designing groundbreaking kite-boarding equipment, SUP, and Kayaks. Pedro is an award-winning broadcast and multimedia designer with a wide range of creative skills at Pixel-Depth.com. He has extensive experience in the prototyping and development of web apps. When not working he’s kiteboarding, coding, and traveling for the next kite spot. Escape the crowds — fly anywhere, anytime for up to 40+ minutes at speeds of up to (32+km/h). Modular and interchangeable wings make it simple to transport, set-up and customize to suit your style of riding. Focus on having fun riding and enjoy the benefit of our sleek jet and foil combo to foil swells easier using just wave power for the ultimate hydro foiling experience. The VeFoil is carbon fiber construction and perfect for individuals, lessons, tours, and resort operators. This short, wide, and high floatation board means easy standing starts/stops, extra stable, highly maneuverable, and transportable. By pre-paying for your electric hydrofoil it will allow us to start production for a spring delivery. In exchange, you will receive a Special Bonus Package that will make you and your new ride stand out from the rest of the crowd! Expected Delivery April – June 2019. *Currently our electric hydrofoil is not available for purchase by US Residents and are not shipping products to the USA until we have a licensing agreement in the USA to process sales. This will be completed by the time the products are ready for shipping worldwide in April – June 2019. Be sure to opt-in to this special email list for us to notify you as soon as we are ready to start shipping in the USA.